It was on July 27, 2016 when Marlon Tapales gave an incredible blood and guts performance in Ayutthaya, Thailand. He was up against Pungluang Sor Singyu (Panya Uthok), who had twenty Filipino victims on his resume. Pungluang dropped Tapales twice with hellish body shots in the fifth, and it seemed the WBO bantamweight title would stay in Thai hands. But Tapales got up and waged a comeback that resembled a Sylvester Stallone script, and stopped Pungluang in round eleven. Winning a world title, especially in such a dramatic fashion, is supposed to boost a boxer’s career. But in the case of Tapales, it led to long periods of inactivity. Tapales had to wait nine months to defend his crown. Still he was a huge favorite against Shohei Omori, a man he already stopped in two rounds in 2015. But despite his efforts to make weight, he was still almost two pounds above the division limit of 118. The title was declared vacant but the fight pushed through with Tapales winning by 11th round TKO. He returned home an ex-champion and his team made known their plan to move him up to junior featherweight. But, he had to wait seventeen months for another fight. There was also a rumored title match against Mexican Cesar Jaurez that didn’t push through. Tapales’ only fight last year was an easy first round knockout of Tanzanian Goodluck Mrema in Metro Manila. The good news is he is slated for a fight in Los Angeles this February 16 against Fernando Vargas Parra (34-14-3,23KO’s) of Mexico. This card is headlined by Leon Santa Cruz defending his WBA super world featherweight title against Rafael Rivera. Boxing writers who have seen him years before he won the world title felt he had the talent to become one of the best produced by the Philippines. Now, pundits are hoping he can at least have more than one fight a year. 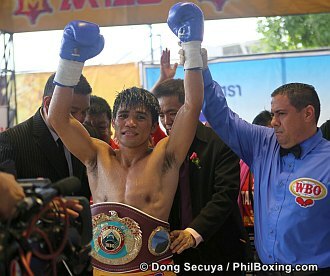 The 26 year old Tapales (31-2, 14KO’s) hails from Lanao del Norte in the Philippines. He is ranked number six by the WBO and seven by the IBF in the 122 lb division. Photo: Marlon Tapales when he won his WBO title in Thailand in 2017.